Exhibition curated by Chien-Min Lu and Jose Luis García del Castillo y López. The exhibition positions material systems as combinations of design technologies with material processing and manipulation environments. Material systems are positioned as central to a research based design enquiry that capitalizes on opportunities that emerge when craft-based knowledge is synthesized with CNC-machines, robotic technologies, additive manufacturing and material science. This year’s course will focus on ceramic systems and includes a collaboration with the Harvard Ceramics Program in Allston (consultant: Kathy King). The course builds on years of collaborative research by the Material Processes and Systems (MaP+S) group at the GSD. Ceramics is the first ever material created by mankind – it is omnipresent in the craft-studio as well as in high-volume manufacturing environments. Pleasing to the touch and easily manipulated by hand, it can just as easily be subject to digital technologies and robotic approaches. 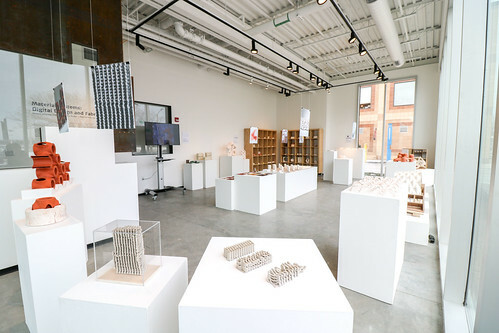 While ceramic-specific aspects of material design and manipulation will be taught emphasis is on understanding ceramics as a microcosm of material research that offers insights which transfer to work with almost any material used in architecture. The course is supported by a grant from ASCER Tile of Spain. A selection of project will also be shown at the 2018 CEVISAMA in Valencia, Spain.